Hey ya’ll. The time has finally come! I’m so happy to announce that pre-sales for my debut comedy album ‘Dangerless’ have officially begun! The album will be available worldwide Friday March 2nd. The album can be purchased as a digital download and is also available as a physical CD. If you purchase the album on iTunes you will immediately get the track “Beer with Dinner” downloaded to your device. The rest of the tracks will be available for download 3/2/18. Note: The first 10 people to pre-order a physical copy from my website get a signed show poster and sticker! I have toured extensively the last three years in preparation for this album and I couldn’t be happier with the way it turned out. It was recorded during one show at Flappers Comedy Club in Burbank, CA and features 19 tracks with topics including my sobriety, fear of flying, moving in with my vegan girlfriend, and the overall idea of wanting to avoid danger. I really hope you enjoy it, and hope to see you at a show soon! California!!! 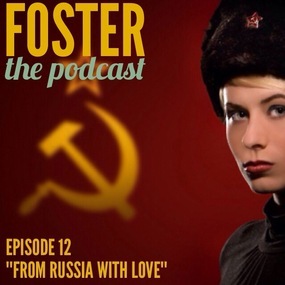 You’re invited to a free live taping of FOSTER THE PODCAST! Subscribe on itunes for new episodes weekly. Comedian Lance Paullin breaks numerous laws on his date with an illegal Russian immigrant.